Nine people have died in clashes with police in the south Indian state of Tamil Nadu amid protests against a copper smelter that residents say is causing environmental damage. 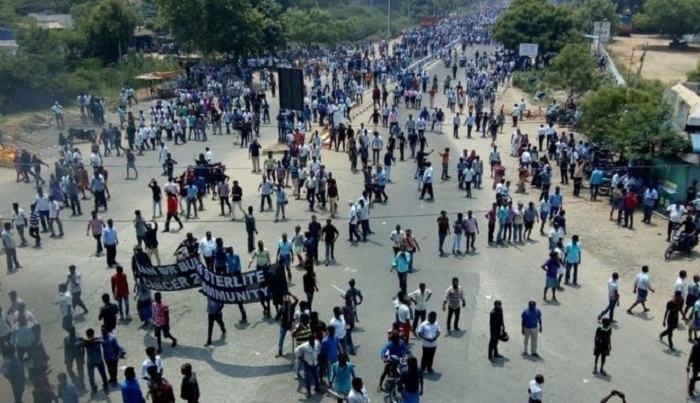 The protests against the Sterlite Copper subsidiary of the Vedanta conglomerate have been going on for months in the port city of Tuticorin. Police say clashes broke out as a huge crowd of protesters stormed district government headquarters. Many others are critically injured. Police said that the crowd had begun throwing stones at police and office buildings, overturned cars and set several vehicles on fire. They say they opened fire as the violence intensified. A state minister defended the actions of the police, saying that it was "unavoidable". "Entering the office and violence is not acceptable... firing [opening fire] became unavoidable," fisheries minister D Jayakumar told reporters in Chennai, formerly known as Madras. He said nearly 3,000 troops had been brought in from neighbouring districts to control the situation. Protesters say the plant is polluting ground water in the area and threatens the fishing industry. The plant has been shut for more than 50 days due to alleged non-compliance with environmental rules. Vedanta has denied all the allegations against it and says it plans to double the capacity of the plant. The company has not commented on Tuesday's violence.